Free license key giveaway for Ashampoo Snap 2018. It’s a multimedia software category on Ashampoo website. 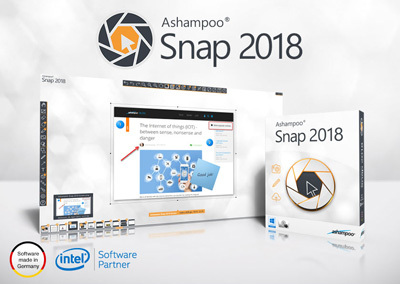 Ashampoo Snap 2018 is free edition but still requires an activation code. Like the Ashampoo Photo Commander giveaway, available unlimited number copy of the Ashampoo Snap serial key on this giveaway. The vendor gives unique license code for each user. Ashampoo Snap is an application to capture a desktop or full scrolling Windows activity and save as image. You can save the result in PNG, JPG, BMP, or PDF file format. The software also features with recording tools. It allows to record desktop activity and save them as video files. Now the new version supports 4K video. The screen recording is useful for creating a video tutorial. Besides recording and capturing function also available editing features. You can add an effect or watermark to image captures using the software. To make easier grab the free license key, I’ve embedded the registration link on this post. The registration link also found on the installation file. If prompt you to enter a license, click on “Request FREE full version key” to open the registration page. Registration page to get free activation code: Registration page! Another version giveaway that still active is version 7. You can also download old version because the new version does not support Windows XP. You may need an Ashampoo account to request the free license key. Please create an account for free on Ashampoo website. The account also available on another Ashampoo giveaway. All software given above is older version. The latest version is Ashampoo Snap 10 with OCR features. To get this new version, you can use coupon code to version with a special price. Read about Ashampoo Snap Coupon to get best deals. Please note. The new version only supports on Win 10, Win 8 and Win 7. If your Win OS version is Vista, XP or lower, download older version that also embedded on this post.